My son is in the picky-eating phase and this super easy recipe is one of our go-to healthy, nutritious meals for him. It's so easy to make and you can make it with your favorite ingredients or whatever you have on hand. I put proportions as a reference but to be honest, I always eyeball it and it always works. The only tricky part is making sure you don't let it burn! Here's a tip: I use a plate to flip it. If I can do it, you can! 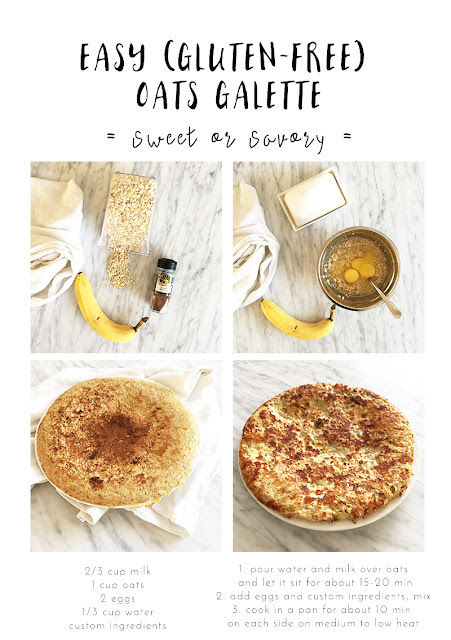 I make mine with bananas + brown sugar and nutmeg for an easy breakfast, but my favorite are the savory ones with sautéed onions, bell peppers and cheese or olives and feta cheese. The possibilities are endless! Oat is naturally gluten-friendly but you can make it gluten-free by using gluten-free oats.